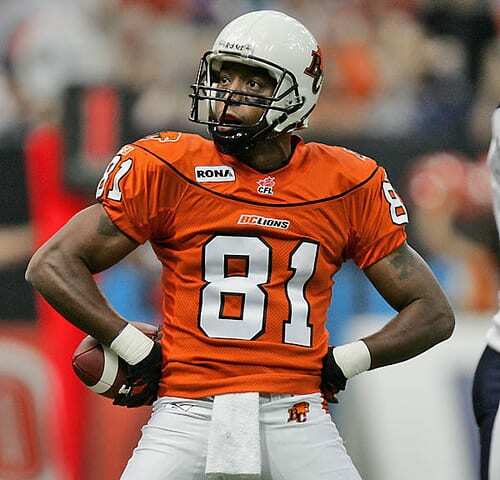 Geroy Simon will be at J Malones Pub in Richmond for tonight's fundraiser for BC Minor Football and the Zajac Ranch for Children. Tonight at 7:00pm at J. Malones pub in Richmond, Bobby Singh and some of his closest football friends will be holding a fundraiser to benefit BC Minor Football and the Zajac Ranch for Children. The event will cap off a great day that will start with the 2nd annual Bobby Singh Down Set Hut football camp at Minoru Park in Richmond for kids aged 8-15. The kids will be taught by several minor football coaches as well as players such as Casey Printers, Geroy Simon and Davis Sanchez. Printers and Simon are two of the names you can expect to mingle with at tonight’s fundraiser. Tickets are $20.00, which gets you a burger and a beer. There will also be a silent auction, and a 50/50 draw, as well as a chance for pictures and autographs from the several BC Lions players in attendance. Tickets are limited, so if you would like to go please send me an e-mail to brian@bclionsden.ca and I may be able to reserve you a ticket.